The name of this pianist from St Petersburg has been known to Russian and foreign audiences for nearly half a century now. Since the time of his victory at the 3rd International Tchaikovsky Competition, Grigory Sokolov has been attracting the attention of connoisseurs of music with the depth and freshness of his renditions that always combine a recognisable, individual pianistic style with a full immersion in the world of the performed work. 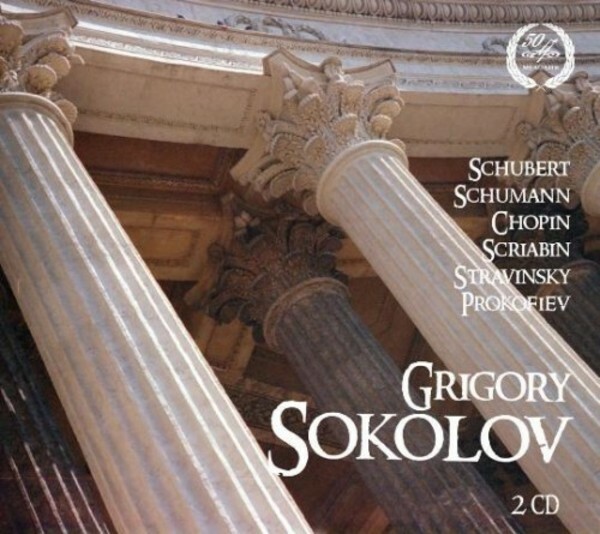 Grigory Sokolov is first of all known as a performer of 'intellectual' music � Bach�s suites and fugues, Beethoven�s late sonatas and Brahms� pieces. This set presents the pianist as an impressive and original interpreter of romantic piano repertoire, including one of Schubert�s posthumous sonatas, Schumann�s Carnaval and Chopin�s and Scriabin�s miniatures, combined with 20th century music such as fragments from Stravinsky�s Petrushka and Prokofiev�s sonatas, which also take an important place in his concert programmes. Grigory Sokolov�s recordings featured in this set embrace a 20-year period of the outstanding artist�s career. You are about to hear him as a vivid romantic virtuoso, a contender for victory at the competition in 1966, an artistically balanced pianist of the next decade and a mature, experienced musician of the late 1980s. The recordings were made in studio and at concert in Moscow and Leningrad.